I really appreciated the way that Jenny (@jennyhalasz) related information in her presentation; from the way Google Panda works to the way Pagerank functions. Pagerank measures the quality and quantity of links to your website and periodically makes updates based on this information. Google Panda evaluates the quantity and quality of the content housed on your site and assigns a value to your website or section of your website. It’s important to note that just because you’ve updated your content, changes will not necessarily be reflected by Google until they update your Panda rank. A 301 redirect is comparable to putting a sign in your window that says “we’ve moved” and contains your new address. A 302 page is similar to putting out a “be back soon sign” which gives visitors no idea where you are or when you’ll return, which can often send your visitors on a wild goose chase trying to find you. Eric (@stonetemple) shared some very insightful information for content syndication, the do’s and don’ts if you will. According to Enge if your team is consistently creating great content that can be published on different sites and if they link back to you, this is a great way to begin building additional links. Don’t get stuck syndicating your content and then not ranking for it! Now that you know what not to do, does this have you considering your current strategy for managing content across multiple sites? I for one appreciated the insight provided by this panel as it was easy to understand and provided great direction for which solutions are most highly recommended. 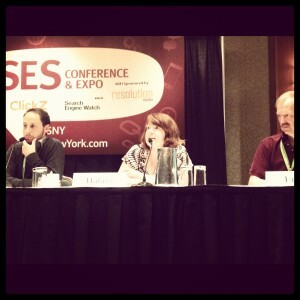 Stay tuned for more #SESNY coverage from our team: @toprank, @leeodden, @azeckman, @bslarsonmn. An extremely interesting, insightful and true post. By posting the same information on all your social media sides you are thinning out the content. Rather take the time to write two great posts than six boring copy paste ones. By over populating your blog your readers become over whelmed and don’t continue coming back. Thanks for your great coverage of SES NY 2012. I’m sorry we didn’t get a chance to meet in person, but I enjoyed chatting with you on Twitter! Ashley-Great insights. The bottom-line is optimizing your search is a great deal of work. We engaged a firm that committed to drive our impressions, clicks and conversions. We found out that we ended-up doing all of the work: blogging, building CTAs and creating back-links. This is especially true if you want to succeed with affiliate marketing in SERPs. You have to rewrite the descriptions that the retailers or manufacturers are supplying you with in order to be unique. that is a great blog thanku.. However search engine don’t rank duplicate contents in most cases, but many websites that are authority, rank high even for duplicate contents too according to my experience. And about authoring, can you please give some examples except article directories?